Russia, Uruguay, Egypt and Saudi Arabia are part of Group A in FIFA World Cup 2018. From Left Igor Akinfeev, Luis Suarez, Mohamed Salah and Abdullah Otayf. When the Russians launched their bid to host the World Cup for the first time after, they were on a high after reaching the semifinals at the 2008 European Championship. Russia goes into the draw as the lowest-ranked of the 32 teams after failing to advance past the group stage of any tournament since 2008. Ambitious talk of reaching the quarterfinals or even semifinals has faded. There are off-field problems, too, with reports of disputes between players and the coach. Hooligan rampages at Euro 2016 tarnished Russia’s image, with the country threatened with expulsion from the tournament in France. KEY PLAYER: Igor Akinfeev (CSKA Moscow) — A talented goalkeeper who captains the team, Akinfeev has tended to make mistakes in big games. COACH: Stanislav Cherchesov — After experiments with expensive foreign recruits like Fabio Capello and Guus Hiddink, Russia goes into the World Cup with a dour, defence-first former goalkeeper. Only Brazil had a more solid performance in South American qualifying than Uruguay. Though some of the team’s players started fading, new ones have emerged for the World Cup. Defender Diego Godin (31) and strikers Edinson Cavani (30) and Luis Suarez (30) still trouble opponents. But youngsters like midfielders Federico Valverde (19) and Nahitan Nandez (21) have become frequent starters. KEY PLAYER: Edinson Cavani (Paris Saint-Germain) — Top scorer of the South American qualifiers with 10 goals in 18 matches, Cavani has been more deadly for Uruguay than Barcelona’s Luis Suarez. 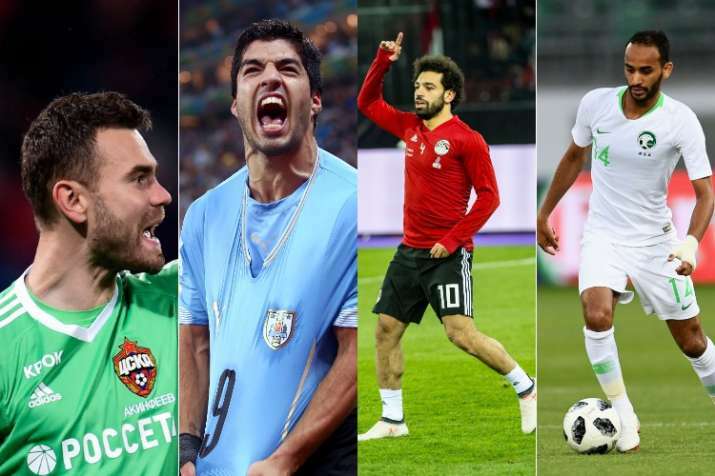 Egypt waited a long time to be back at the World Cup. The record seven-time African champions last qualified in 1990. The team hit new lows recently, failing to even qualify for the African Cup of Nations from 2012-15. It’s back now, reaching the final of this year’s African Cup and following that up with a long-awaited World Cup return. KEY PLAYER: Mohamed Salah (Liverpool) — Delivered when it counted with five goals in six games in the final round of qualifiers, including the late penalty that took Egypt to the World Cup. COACH: Hector Cuper — There have been murmurs of discontent over the conservative style favoured by the Argentine coach. His team focusses on defence first and counterattacks when it can. There can be no denying Cuper’s tactics have been successful, though. Juan Antonio Pizzi, who was named Tuesday as the new coach, will be tasked with improving on Saudi Arabia’s best-ever performance at World Cup — the second-round exit at the 1994 tournament in the United States. KEY PLAYER: Mohammad Al-Sahlawi (Al-Nassr) — The 30-year-old striker was instrumental in helping the Saudis reach the tournament with 16 goals in qualifying.